Hong Kong-based Chinese singer G.E.M – real name Tang Tze-Kei – will be bringing her Queen of Hearts World Tour to Malaysia this November. The tour is to support her fifth studio album “Heartbeat” which features some of her greatest hits like “Long Distance”, “Moments”, and “One Way Road”. The 26-year-old singer started her singing career with her self-titled EP “G.E.M.” in 2008. Since then, she has won a series of awards, and is known as the “Young Diva with Giant Lungs” for her vocal range. The abbreviation for her name stands for “Get Everybody Moving”, and that is what she wants everyone wants to do via her songs. In 2014, G.E.M won the Nickelodeon Kids' Choice Award for Favourite Asian Act, and in 2016, she was the only Asian featured in the Forbes 30 Under 30 music segment. G.E.M first came to Malaysia in 2015 as part of her X.X.X. Live World Tour, so this will mark her second visit to the country. 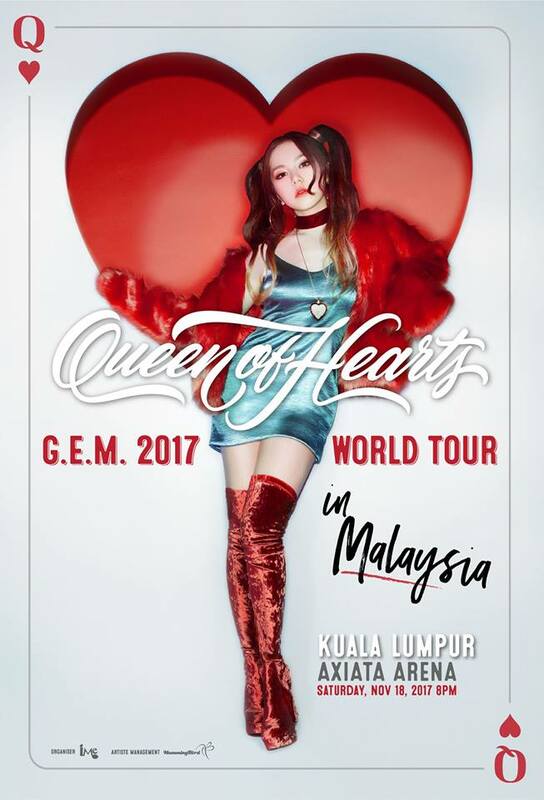 Brought to you by IME Asia, G.E.M Queen of Hearts World Tour in Malaysia will take place on 18 November 2017 at the Axiata Arena. Ticketing details will be released soon. Stay tuned.